Porsche, the German manufacturer of automobiles majority owned by the Austrian Porsche and Piëch families. It was founded in 1931 by Ferdinand Porsche, an Austro-Hungarian engineer, born in Maffersdorf (Vratislavice), Bohemia (now part of the Czech Republic) who also designed the first Volkswagen. The company is headquartered in Zuffenhausen, a city district of Stuttgart, Baden-Württemberg. The history of Porsche road cars is undoubtedly dominated by the history of the Porsche 911, and its predecessor the 356. Ferdinand Porsche played an important role in the development of airplanes and racing cars, and the construction of tanks for the Wehrmacht. He is an automobile engineer with more than a thousand patents to his name. He was appointed chief engineer at Mercedes-Benz in Stuttgart in the 1920s. Later on, he set up his own engineering workshop and designed among others the Volkswagen. At the plant where Volkswagen was made, Wolfsburg, he was chief of operations and at the end of the war he was interned by the Allies.He was released a few years later and started building his first car with his son, Ferry Porsche. After his post-war release from internment in France, Ferdinand Porsche settled in Gmund, Austria, where he created the first Porsche cars, with 1086cc. VW-based engines and sporting light alloy roadster bodywork. However, he found working conditions at Gmund too difficult, with shortages in materials, components and skilled labour. Porsche cars were then relatively cheap, and demand high, so, after building 50 of this original model 356, Porsche moved to Stuttgart-Zuffenhausen in Germany. 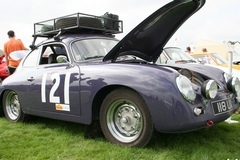 The Porsche 356 and it was a sports car and a reminiscent of the Volkswagen. It had the same four-cylinder boxer engine that was rear-mounted, just like the VW. It was far from being a powerful sports car, developing only 40 bhp and a maximum speed of 87 mph (140 km/h). First produced as a convertible and later as a hard top it distinguished by the very elegant and innovative body. It was developed in theworkshop of Erwin Komenda, a master of restrained streamlining who had been in charge of sheet metal and design techniques at Porsche since the VW Beetle. The new style of closed coupe was designed by Komenda and it soon became the embodiment of the sports car, thanks to its fastback. This tradition was continued by Komenda and Ferdinand “Butzi” Porsche, the founder’s grandson, with the 911. The 911 became easily recognizable: it had attractive sloping bonnet and what later became characteristic “frog eye” headlights, curves running from the top edge of the windscreen to the rear bumper and a straight waistline. From a functional and technical point of view it was more like BMW 1500, although it retained the stylistic features of the original Porsche. The new 911 will become the foundation stone of Porsche’s identity, even though the design was not always appreciated. During the 1970`s and 1980`s, the designers attempts to distance Porsche from its legendary design brought the company to the edge of disaster. The more modern 924 model, “a people’s Porsche”, developed with Volkswagen, as well as the 928 were far from fulfilling the expectations. In the 1990`s, the company realized that what for over twenty years was perceived as a straitjacket, it was in fact a marketadvantage. During the 1990`s, Porsche became highly profitable since they now knew that the typical Porsche features were timeless. Nearly forty people now worked in the design department on further developments of the long-running 911. These developments included the 911 GTI, a powerful combinationof sports and racing car, put forward by the in-house designer Anthony R. Hatter. By 1997 the all new Water-Cooled 911 arrived, which resulted in records sales for Porsche every year there after. The Boxster and the Cayenne enabled Porsche to firmly establish it's second independent range of models. By 2007 Porsche had moved to an every increasing annual basis of profitability as the world's most profitable car manufacturer, with annual profits in excess of of €4billion a year. With the twist in the fate, the automotive giant that was Volkswagen had endured many years of declining profitability in the face of global competition. By the start of 2008 Porsche had maneuvred the necessary German Laws in order to purchase a controlling stake in the VW group to create a new Porsche Holding Company. Had Ferdinand Porsche been alive today even he would have found it amazing that Porsche would one day control Volkswagen and all of its subsidiary holdings. The Porsche badge is essentially the coat of arms of the city of Stuttgart, which was built on the site of a stud farm, hence the horse. The antlers and red-and-black stripes are part of the arms of the Kingdom of Wurttemberg. Which creates the Porsche Logo. At the start of the 1950s, Professor Ferdinand Porsche, his son Ferry and their trusted circle set about developing a company emblem that they intended both to refer to their location in Stuttgart and to have a dynamic, powerful image. A crest was finally created that has long since become the company’s trademark all over the globe. The emblem was initially put together out of elements from the history of Württemberg-Baden, as the political region was still called at that time: Stylised antlers and the state colours of red and black. This was intended as a clear commitment to Swabia, the Porsche family’s second home. The centre of the crest shows a black horse rampant, an expression both of forward thrusting power and a derivation of the city seal. 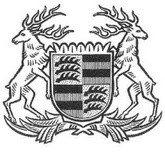 For Stuttgart, established in 950 as the stud farm of ‘stuotgarten’, has had horses in its coat of arms in varying designs since the 14th century. Through the use of the steed and the word ‘Stuttgart’, the team at Porsche were giving a clear sign of the bond they felt with the town in which they were based. The crest has the outer contours of a shield, while the word Porsche as the overarching signature, the roof over the whole, as it were, crowns the highly effective composition. And thus in 1952, the 356 bore the characteristic shield for the first time. It appeared on the horn in the middle of the steering wheel, something, however, that Professor Ferdinand Porsche, who died on 30th January 1951, was not to witness. 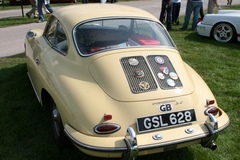 By the end of 1955, the crest was also to be seen on the bonnet of the 356, integrated into the handle. And while the handle no longer exists, the crest on the bonnet has remained. There has never been any reason to contemplate changing the Porsche crest’s symbolic and powerful design and thus to risk modernising it to death. 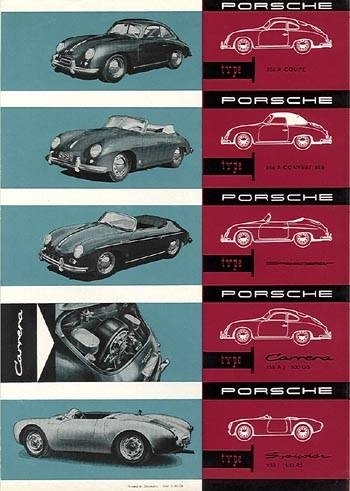 Although the lettering has been slightly trimmed and the horse’s contours smoothed over time for printed versions, brochures and correspondence, for Porsche fans, however, in Germany and around the world, who associate the sports car in iconic fashion with this image, nothing has changed for 50 years. 1875: On September 3, Ferdinand Porsche is born in the Bohemian town of Maffersdorf. In 1889, after attending grammar school there and the Staatsgewerbeschule (State Vocational School) in Reichenberg, he entershis father’s business as an apprentice plumber. 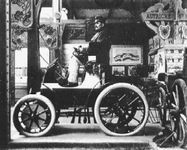 1900: The Lohner-Porsche electric car is presented at the World Fair in Paris. The wheel hub engines of the young engineer Ferdinand Porsche bring him international attention. In the same year, he develops an all-wheel-drive racecar, as well as a hybrid petrol/electric vehicle – a world first. 1906: Ferdinand Porsche becomes Technical Director at Austro-Daimler in Wiener Neustadt. At the age of only 31, he is responsible for the model range of one of Europe’s largest automotive concerns. 1909: Ferdinand Anton Ernst Porsche, later known as ‘Ferry’, is born on September 19 in Wiener Neustadt. 1910: The Austro-Daimler touring car designed by Ferdinand Porsche scores a triple victory in the Prince Henry Trials. At the wheel of the winning car sits none other than Ferdinand Porsche himself. 1923: As Technical Director and Board Member of the Daimler-Motoren-Gesellschaft in Stuttgart, Ferdinand Porsche designs the legendary Mercedes Compressor Sports Car. The following year, the 2-litre racecar developed under his aegis wins the Targa Florio. The Mercedes-Benz S-Type models dominate international motorsport from 1927. 1931: Crowning his career, Ferdinand Porsche opens an office for ‘engineering and consultation on engine and vehicle design’ in Stuttgart on April 25. Created for such renowned manufacturers as Wanderer, Zündapp and NSU are not only entire vehicles, but such trend-setting detail solutions as the Porsche torsion bar suspension. 1933: For Auto Union, Porsche develops a Grand Prix racecar with a 16-cylinder engine in mid-ship configuration. 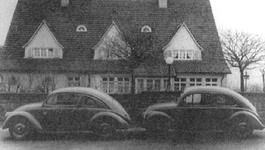 The rear-engine vehicle concept designed for the compact car (Type 32) developed for NSU is ultimately incorporated in the Volkswagen Beetle. 1934: The company Dr. Ing. h.c. F. Porsche KG receives an official order for the design and construction of a German Volkswagen. Only one year later, the VW prototype is test driven. The ‘Ur Beetle’ is assembled in the garage of the Porsche villa in Stuttgart. 1935: Ferdinand Alexander Porsche is born on December 11 in Stuttgart as the eldest son of Ferry Porsche. 1936: Parallel to road trials of the Type 60, production facilities are erected under the direction of Ferdinand Porsche for the Volkswagen renamed the ‘KdF-Wagen’. 1939: Under the designation Type 64, three racing coupés are developed at Porsche in Zuffenhausen. Built for long-distance endurance competition, the ‘Berlin–Rom-Wagen’ are considered the forefathers of all later Porsche sports cars. 1944: Owing to wartime conditions, the Porsche KG engineering office moves to Gmünd in the Austrian province of Carinthia. 1946: Under the direction of Ferdinand Porsche’s son Ferry, design of an all-wheeldrive Grand Prix racecar – the ‘Cisitalia’ (Type 360) – is begun for Italian industrialist Piero Dusio. 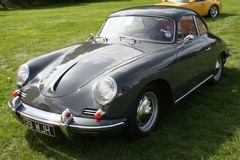 1948: June 8: First Porsche car is the 356, is the first sports car to bear the Porsche name. Registered in Gmund Austria, it had a 1086cc 30kW VW engine, the ‘No. 1’ is roadcertified in June. Only one month later, the lightweight mid-engine roadster wins its first class victory at the Innsbruck Stadtrennen. 1950: Porsche KG returns to Stuttgart-Zuffenhausen and commences series production of the Porsche 356.